Due to a sudden unprecedented string of Mostly False, False, and Pants-on-Fire statements, Newt Gingrich's Truth Quotient has plunged to a paltry 0.25. Newt hurtled past Nancy Pelosi to the downside leaving only Michelle Bachmann between him and chain emails for truthfulness. Here for the record are Gingrich's latest falsehoods and the relevant PolitiFact.com statement ratings and links to supporting arguments. Newt: The congressional ethics investigation against him was conducted by "a very partisan political committee" in a way that "related more to the politics of the Democratic Party than to ethics." 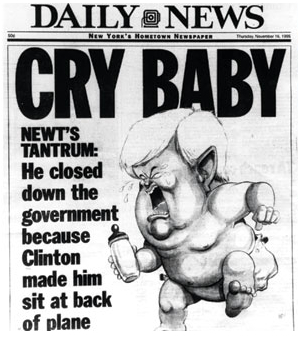 Newt: "I never favored cap and trade." Newt: "The only reason the unemployment rate is going down is because … twice as many people dropped out of the employment pool as the number of jobs were created." Newt: President Barack Obama "has now spent three years proving that he kills jobs in energy, he kills jobs in manufacturing." Should Newt Gingrich (TQ = 0.25) win the Republican nomination he will be facing President Obama (TQ = 1.51) in the general election. Panderbear hopes the electorate cares whether or not they are being told the truth, but isn't optimistic. 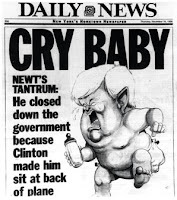 Gingrich's precipitous drop in TQ was simultaneous with his equally precipitous rise in Republican primary polls.